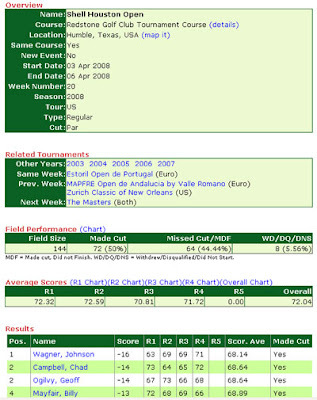 Golf Predictor is glad to announce more convenient navigation between related tournaments. As shown in the screenshot above, every tournament page now has a Related Tournaments section. This new section makes it much easier to navigate to other tournaments of possible interest. You now can directly click on the same tournament in other years, other tournaments played the same week or in the previous or following weeks.